Material: Profile in aluminium. Diffuser i PMMA. Installation: Suspended in 2 m steel wire. Wire suspension allows vertical adjustment. 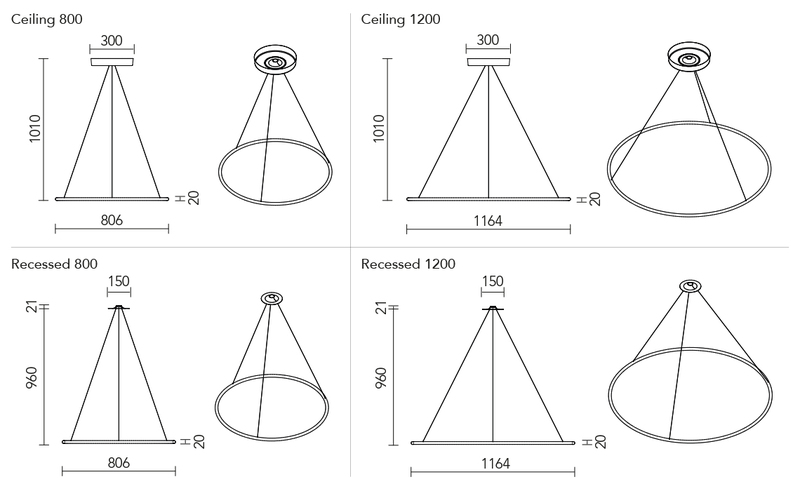 Supplied with mounting kit for recessed or surface ceiling installation. Connection: Excluding connection cable to the primary side. The secondary side comes with transparent cable. Light source: Including LED light source from LED Linear, colour temperature 2700K, 3000K or 4000K. Colour rendering CRI 80. Chromaticity tolerance max 3 SDCM. Lifespan: L80B10 60 000h. Driver: DSI/DALI driver with dimming 1-100%. SwitchDim and CorridorFunction possible. Lifespan: 50 000 hrs. Standard finish: Anodised matte black or anodised matte silver.